Living successfully in another country requires subtle adaptation to your new world. This household has combined the Virgen of Guadalopue with Angelina Jolie. The subtlety is lost on some people. Just as Buddhists leave little offerings in their houses, the Virgen of Angelina Jolie leaves a box of scarves for fashion conscious women to sort through. If you have third world child to offer back, the box is big enough to hold it and would make Angelina very happy. Edna and Ralph have already been given new names – Terry and Sharon. Ralph/Terry is experiencing what is called Name Change Resistance. 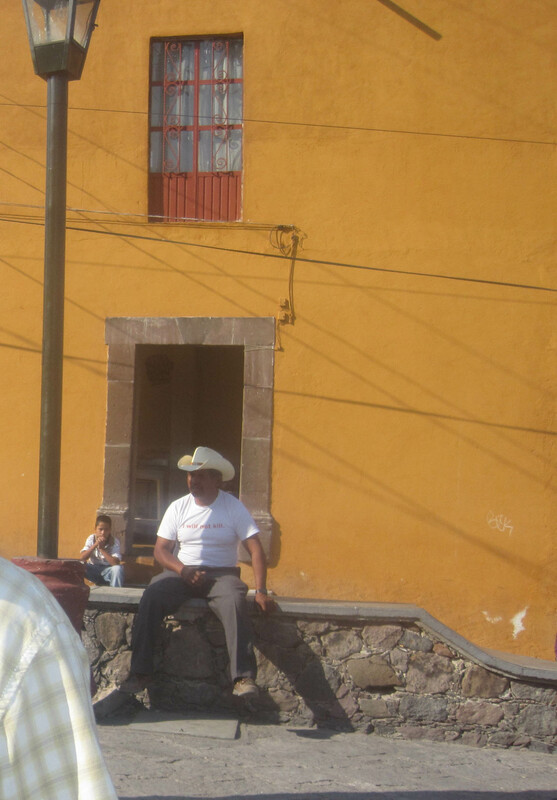 Straight men have a difficult life in San Miguel. They never wanted to move there in the first place but retirement disorients straight men. Going from a somebody to a Retired Straight Man with no interests save Golf makes them most vulnerable. Before they know it, their wives have arranged a vacation in San Miguel and within a few days of arriving the purchase of a new house. Vulnerable and in a fog they find soon themselves at a Naming Ceremony with a new Name. Sharon has adapted very quickly to her new name. 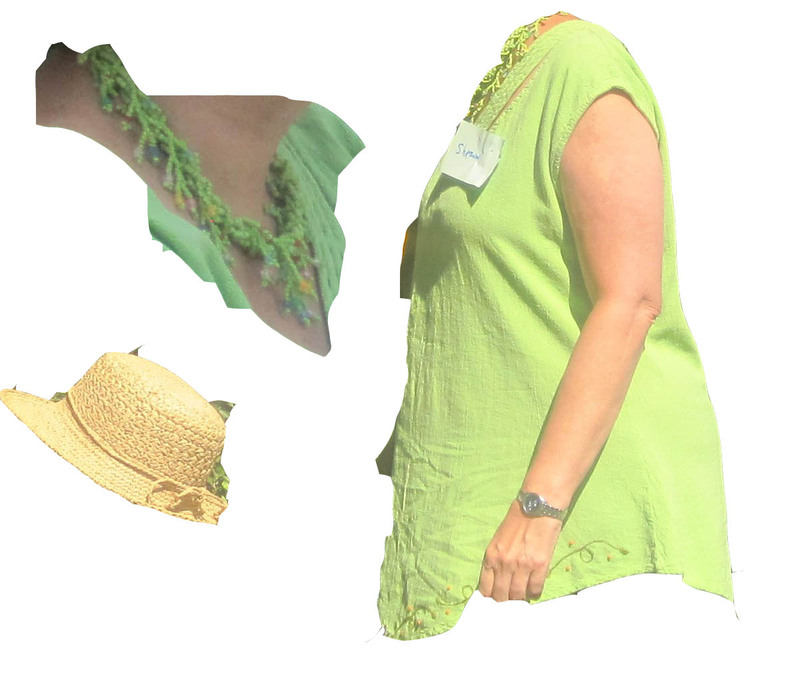 She already has bought her straw hat, a piece of identifying jewelry and a new outfit and color coordinated them. Ralph/Terry is resisting a straw hat, hiking pants, a leather back pack and a water bottle. Here Sharon points out what Terry should look like. There is going to be a fight as Terry is waking up. Reinventing yourself is a long process. It often starts with a name change. Our names are not really our names but the names our parents choose for us and reflect the lives our parents had or wanted us to have. Imagine the kind of life being called Amber or Troy would create. Women for years used to experience name changing. Marriage used to mean a new last name. So many women in San Miguel have already gone through the process of adapting to a new last name and reinventing themselves as a Mrs. But feminism caused some of the magic of a new name to disappear. Yet there are times when a new first name is a necessary step in becoming a new person..
You may think that a name is just a name and that you can just make it work. Although you can work to bring out the positive qualities in your current names, the restrictive conditions will influence your overall destiny. This thinking is at the heart of the Name Changing Ceremony in San Miguel. A new name is the beginning of a new life in San Miguel. Here Edna and Ralph are seated in the Jardin just after receiving their new Names – Sharon and Tony. 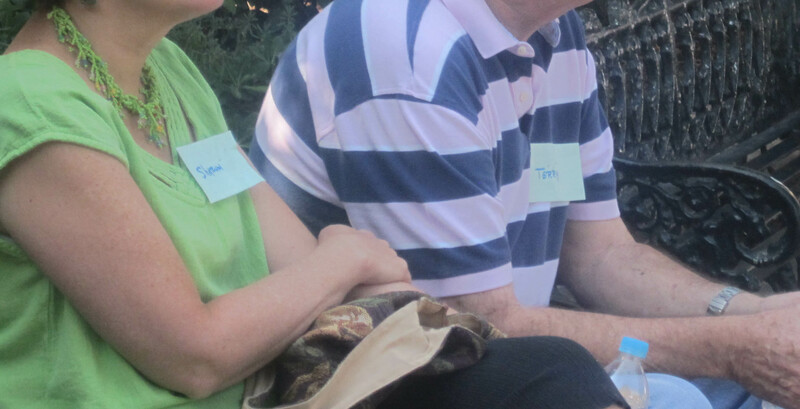 Nametags are used to reinforce the new names and remind others of your new name. These Nametags are worn for one month and at the end of that time, the new name usually sticks. Welcome to San Miguel Sharon and Tony*. * Ric, in a comment, has found through careful analysis that Tony is really Terry. Mexico has had some terrible publicity that affects tourism. Reports of murder and drug wars makes many tourists nervous. So if you can get a Tourist to Mexico then no effort should be spared to assure this Adventurous Tourist that all is well. 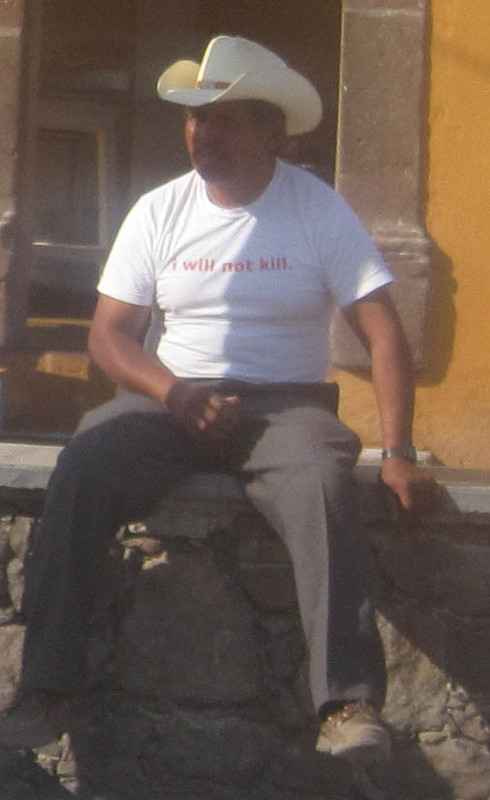 In new twist on promoting safety, the San Miguel Tourism Board launched the I Will Not Kill Program, today. Certain locals who might look dangerous, are given new T shirts to wear. 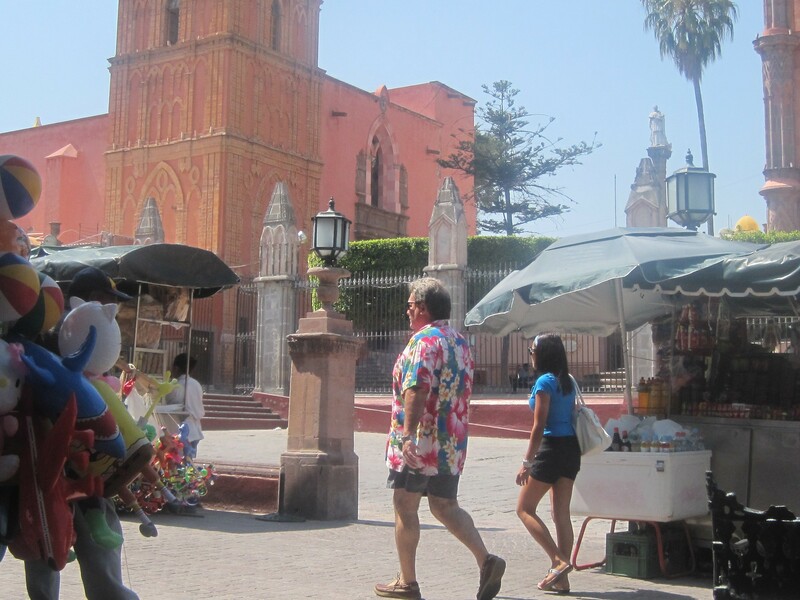 They sit in conspicuous places in San Miguel wearing these T Shirts. One look and the nervous Tourist knows they have nothing to fear. Please come to Mexico and in particular San Miguel because potentially dangerous looking individuals have been identified and T Shirted for your Safety. 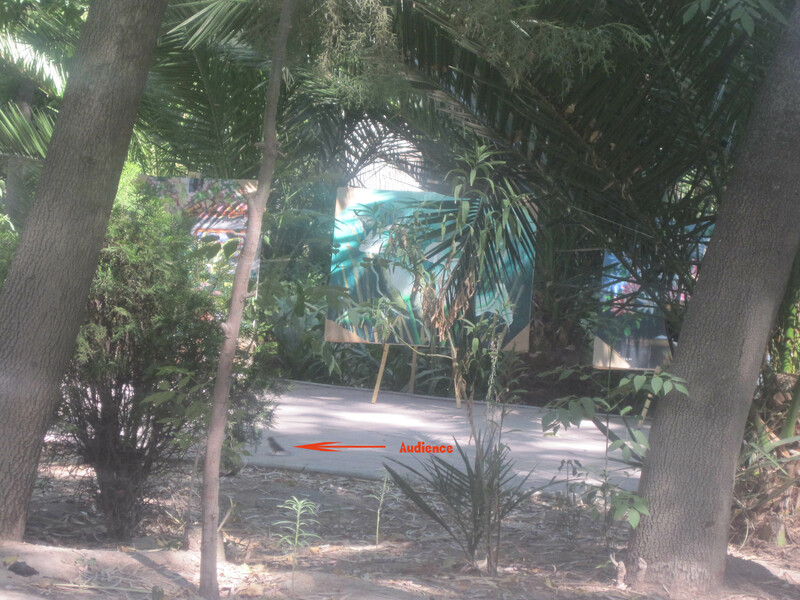 Next Saturday came and I took my Art to Parque Juarez. I found a good place and set it all up and waited. The only thing that stopped and looked at it was one little bird and it was only a glance at that. 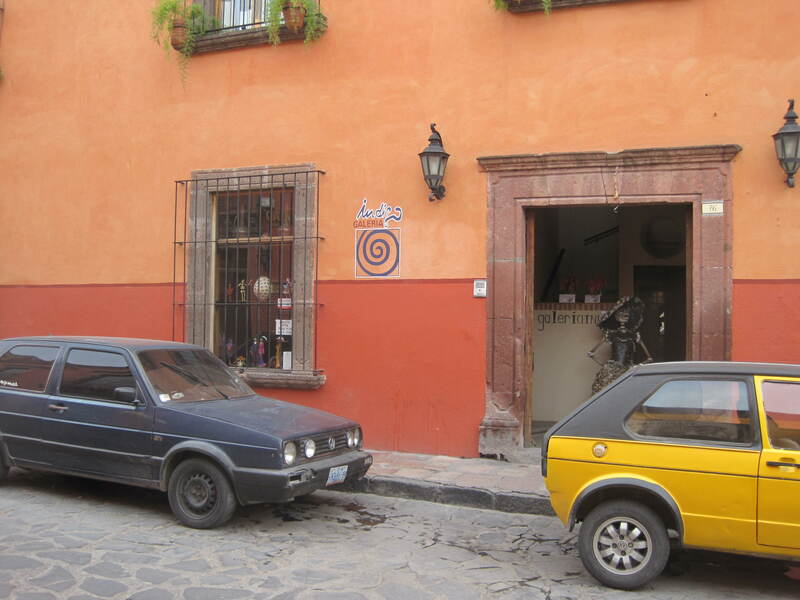 I was rejected by every art gallery in San Miguel. Art owners can be a nasty bunch and if I hear the word talent again I am going hit someone with my number 8 pencil. I think that is unfair. Talent is judged by consumers not distributors. If someone buys your art then you have talent. These gallery owners aren’t buying but merely displaying your art. No matter what I said or did after showing them my portfolio – not a single one would have an opening for me. I was rather discouraged until I looked in Atencion and found under Que Pasa a listing for an Art Show in Parque Juarez. 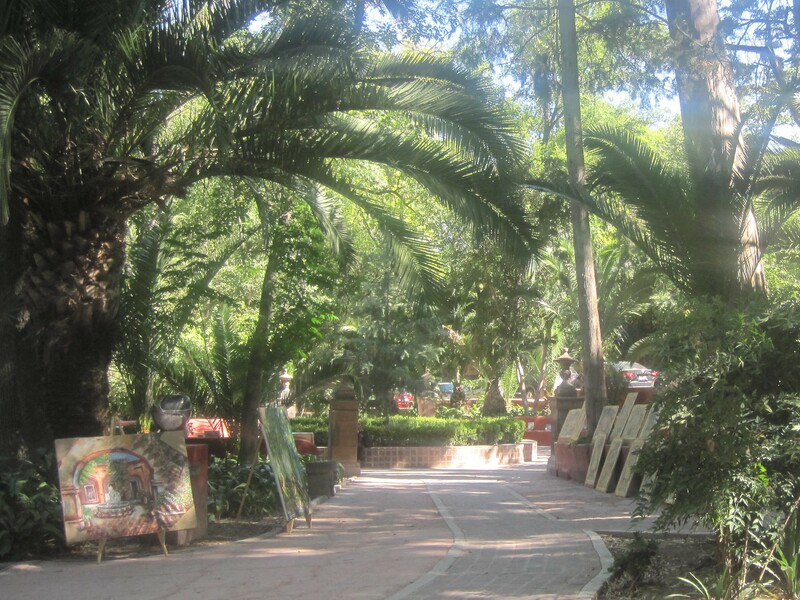 I got up early and headed to Parque Juarez. 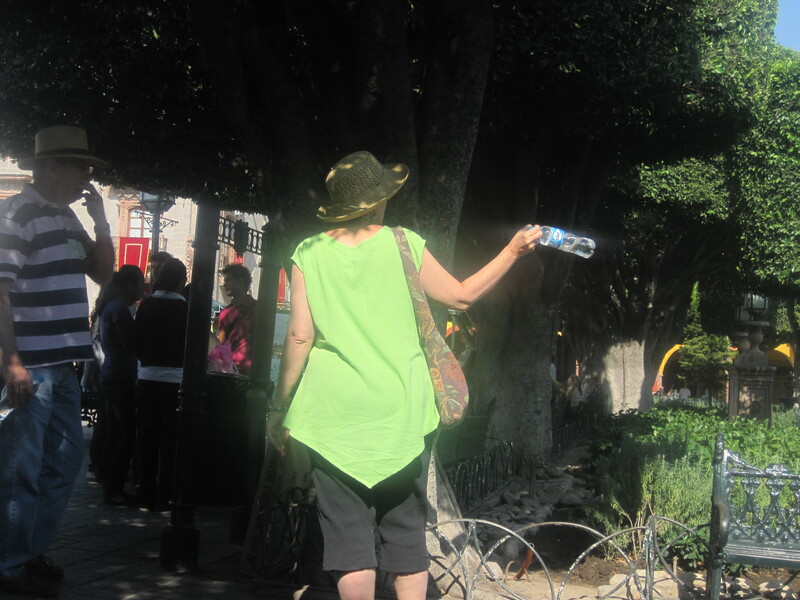 Imagine my delight in seeing Rogue Artists displaying their treasures in Parque Juarez. One Rogue Artist even had little easels for them. It was like a little cane to help them. These Rogue Artists didn’t need a Gallery. They simply used what was available in Parque Juarez to show their talent. Art was propped up against walls or set on big easels for everyone to see. There was no Art attitude – just that Rogue Attitude that says I am going to do this no matter what the Art Establishment has to say. It is like that Helen Reddy song “I am Woman” except this is “I am Artist” – see what I painted. My favorite was the Rogue Artist who used little tiny stones to prop up the Art. It was like saying – my Art is Fragile but these Stones will protect it until you buy it. Or maybe it was part of the Art. I never understand some Art. I have never lived in a country where most residents were Catholic Well I did in live Quebec for a while but that doesn`t count. 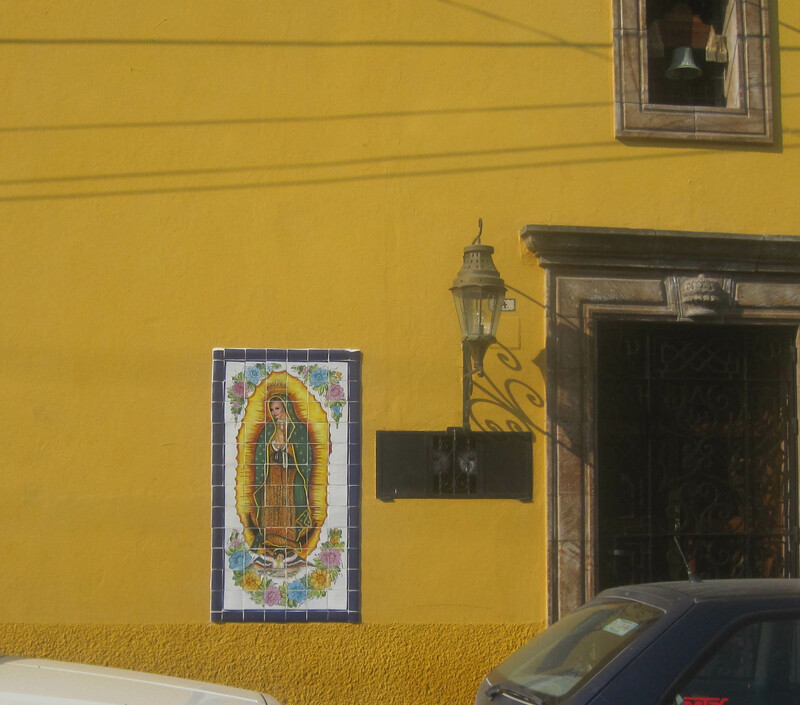 There is a lot of faith in Mexico and there is a lot of liberal faith in San Miguel. 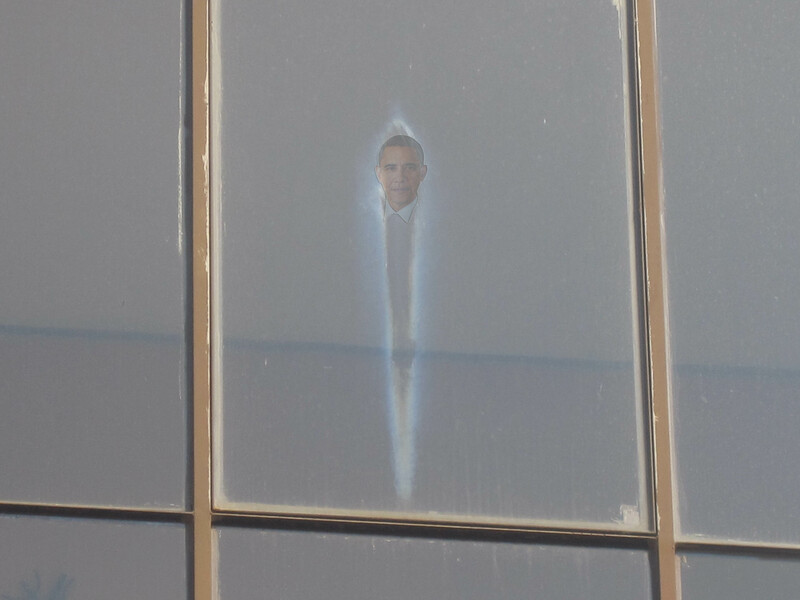 The other day, an image appears in our second floor window. We are of little faith but we kept looking at it and finally in the middle of the Gulf Oil Spill a miracle finally appeared. 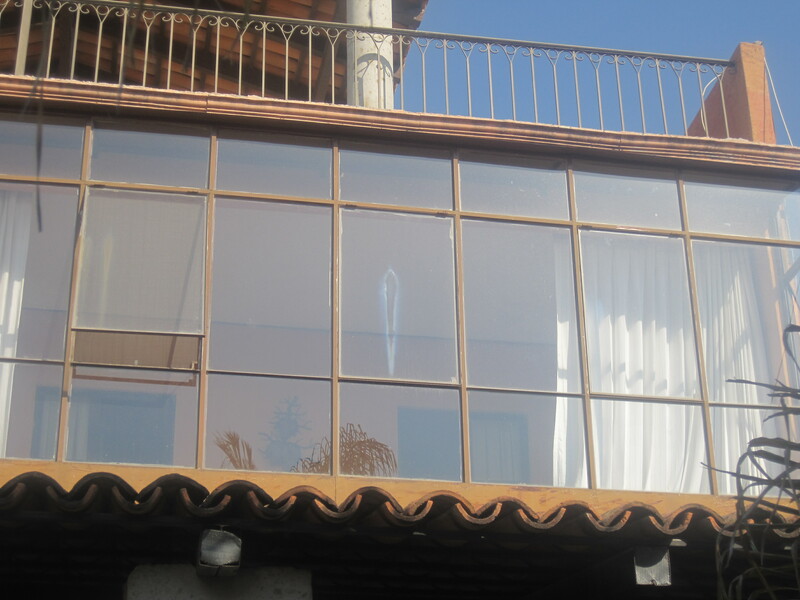 I just hope the maid doesn`t wash the windows. Lastly but well-worthy of mention is this humorous take at San Miguel Gangs on all UNESCO sites, a comparison of San Miguel with Tallinn Estonia, another new UNESCO inductee. Though they may be dead serious. (It’s definitely one of the best blogs I’ve read this week!) Humor from San Miguel Ex-pats remains a rather precious commodity check the newsgroups if you don’t believe me. Note that word “Civil” in the title and proceed with caution. It seems counterproductive to explain satire because if you don’t get it, will an explanation cause you to get it. I think not but one should always throw out lifelines to the literals so that they don’t think you are mean. Okay – here goes. If you put on what looks like a rug and a pair of Combat Cocktail Sandals walk around the Jardin with a puppy and approach people asking people to adopt a puppy what do you expect is going to happen. Someone is watching. Someone is judging. Not everyone is going to see what you see. Some will snicker and some will not. Snickerless people are those who see the same thing as you do but those full of snickers see something quite different. Satire is about that which makes us snicker. What did this woman think people would see? Or more importantly what did she see when she left the house that morning? Given a choice between a parasol and sun screen which choice will call less attention to yourself. You can’t see sunscreen but you can see a parasol. Given the choice between a spring coat and a throw from the chair nearest you, which would call less attention to yourself. Two attention getters lead to one conclusion – this woman wanted to call attention to herself. The visuals of San Miguel are the cause of the Satire Gang. How long does it take, sitting in the Jardin, before you begin to wonder about the cause of the visuals that parade in front of you. These are people who came from the same culture that you did. Given the camera in your hand you take your first picture of a visual and ruminate. “What is going on here?” And the visuals keep on coming until you are forced to comment. For some of us the only reaction to the action of a parasol is satire. It is the same when a really fat man wears a tight T-shirt and by so doing calls attention to his fatness. The Satire Gang sees San Miguel quite differently than the Tourist. The Tourist want to experience a world that is different from their own. That is why they love Europe. When they come to San Miguel they expect San Miguel Disney. 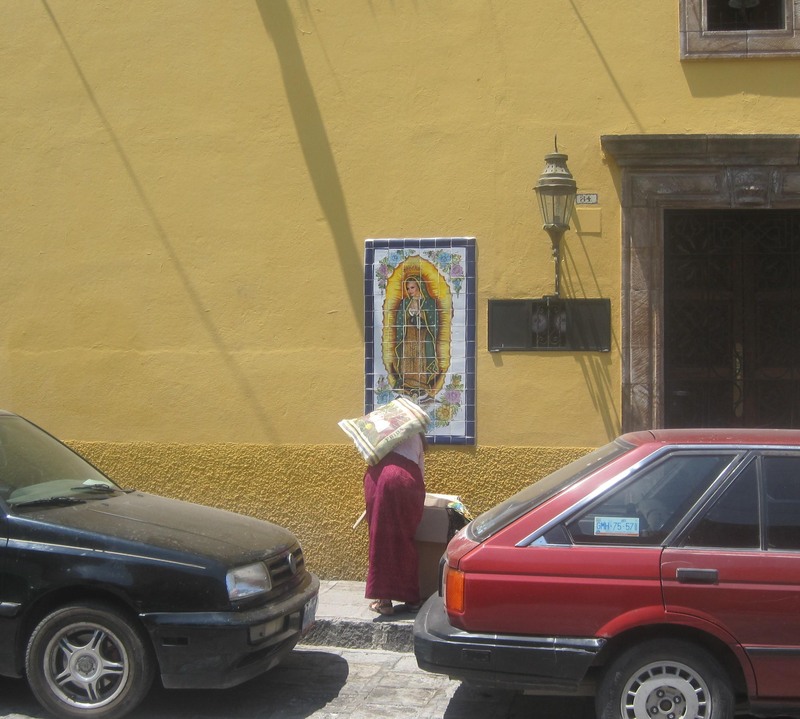 Their cameras are aimed at what is different – the Parroquia, the mendicants, the Mariachi bands, and all the festivals. For some reason they don’t see what the Satire Gang sees – a group of middle-aged North Americans trying to be what they think is authentic and wanting everyone to see how authentic they are. The Tourist is missing the best show in town – their own people.